I knew I'd be back for another Fix, and as we head into fall, I figured I need something besides all of my LuLaRoe leggings to keep me warm! My note to my stylist this time mentioned that I'd love some olive green cargo pants, and a cozy cardigan in a darker color. I also mentioned that I do have lots of leggings, so I'm always looking for longer shirts and sweaters. My stylist, Kat, hit it out of the park and I'm keeping it all. The first item I tried on from my box was this Rockdale Pullover Sweater from RD Style. It's a light knit in a great olive color. The regular retail is $68. I like this sweater so much, I'm planning to keep it clean and new for our family holiday picture in a couple weeks. I did order a few camisoles from Amazon after deciding to keep this sweater, as it's not sewn all the way down the sides (by design). No one wants a glimpse of profile mummy-tummy here. My stylist also mentioned that the light weight of this knit makes it perfect for layering under a cardigan or coat. I'm wearing my own LA Idol jeans in this picture. Next up were the Kut from the Kloth Brigitta Cargo Skinny Pant in Olive (regular retail $88), and the Market & Spruce Evella Boatneck Top (regular retail $64). The pants are ankle-length, which might sort of bug me if we weren't well on our way into boot season. I can't get into the booties and bare ankles thing. Makes me cold just to see someone else's poor ankles out in the elements. LOL Otherwise, I have another pair of Kut from the Kloth pants and knew I'd be pleased with the fit - I was right. The Evella Boatneck Top has great detail at the bottom (like a layered shirt), and on the inside of the shirt cuffs. This shirt was my least favorite item in the box since it's less versatile (I'll probably just wear it with regular pants or jeans), but with all the love in this box, that isn't saying much. They're both keepers. Per my stylist's suggestion, I next tried layering the RD Style Kalin Draped Cardigan (regular retail $68) over the previous outfit. I seriously have a white (ish) cardigan I wear a lot of the time. It's so old, the white is questionable at this point. I love having a new cozy cardigan in a more stable color. There are even little pockets at the front - yay!! It's also long enough to be great for layering with another shirt and my many leggings. Last but definitely not least is the RD Style Jana Poncho Pullover. It retails for $78. See, I already have an incredibly comfy poncho that was hand-knit for me by my mom. I wear it a ton, and almost feel a little guilty having another poncho to love. 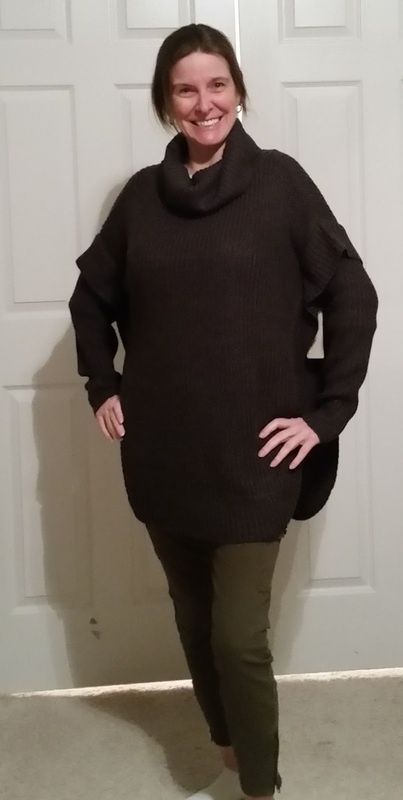 The style of this poncho is interesting in that it has quite structured sleeves, and the poncho and cowl neck seem almost like an overlay to the sleeves, if that makes any sense. The sleeves also help the body of the poncho be a little more form fitting. I definitely can't wear it as a stand-alone top, but if I knew I was leaving it on all day in the spring or fall, I could opt for a lighter short-sleeved top, as the sweater is pretty modest on its own. Overall, I really liked this whole Stitch Fix box. The full retail was $366, but once I deduct my $20 styling fee (already paid), and my 25% discount for purchasing all five items, I get everything for $254.50! It'll probably be my big fall/winter purchase for clothes, and I'm happy with that. Cute. Looks like you're ready for winter. I'm glad you like everything. You look cute and happy! Happy Fall! I love Stitch Fix. It's a great way to update your wardrobe. Great stitch fix review. Just in time for the Winter season. Amazing.